Posted on November 17, 2017 at 3:38 pm. The $195 million, three year long renovation of the Portland Building has begun! Many already know that the City of Portland’s main administrative building is considered one of the first examples of Postmodern architecture, and that its western façade is the home of Raymond Kaskey’s iconic Portlandia. It is less well known however, that hundreds of additional public art works are normally housed within the building. This summer and fall RACC Public Art Collections staff prepared for the renovation by clearing the walls on all 15 floors of the Portland Building. Most of the contents of the 2nd floor Public Art Gallery also went into storage, but a few of the largest and most popular Portlandia related items will continue to be on display right across the street in The Standard’s Insurance Company’s Plaza Building. 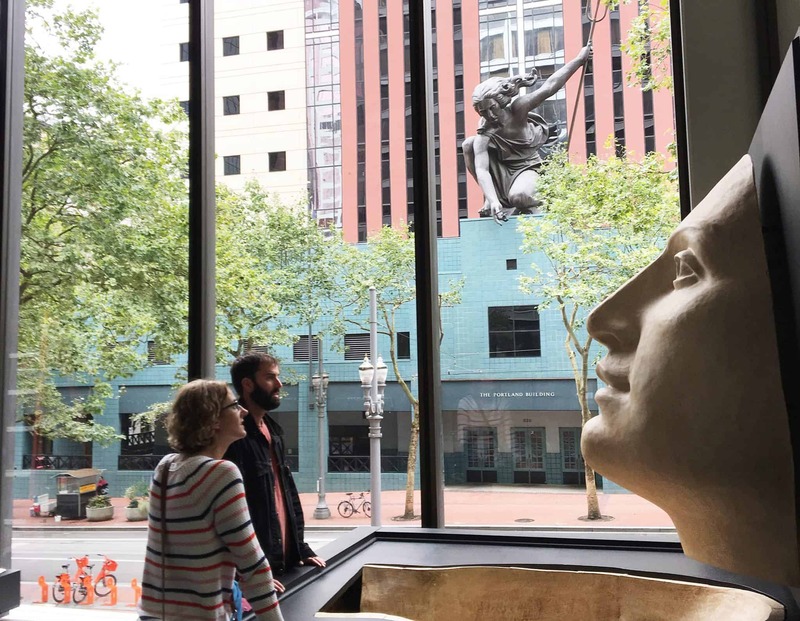 This summer RACC reached out to The Standard to see if they would be interested in exhibiting Portlandia related artwork on the 2nd floor lobby of their Plaza Building at 1100 SW 5th Avenue. The L-2 lobby, with its towering floor-to-ceiling windows, looks directly across the street at Portlandia and the Portland Building. The response from The Standard was enthusiastic. 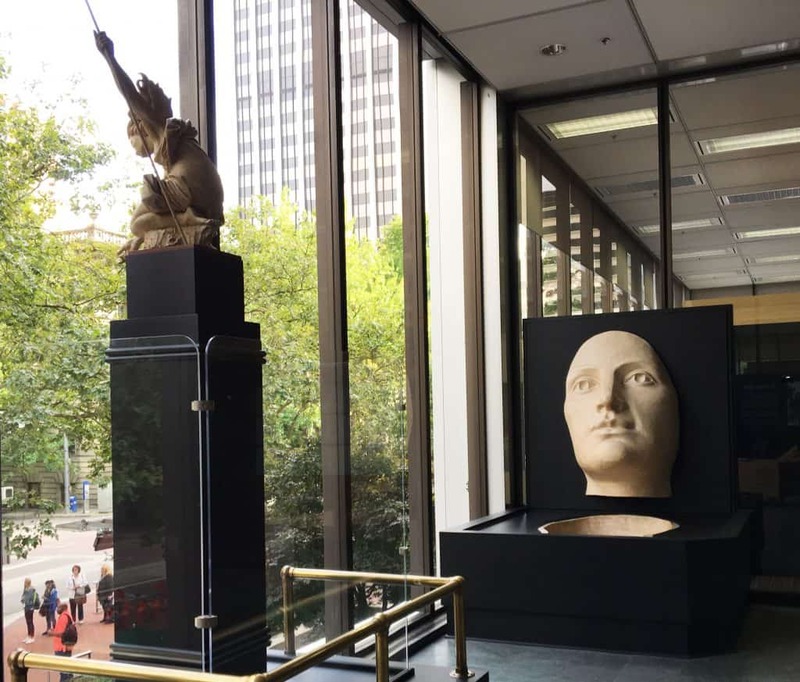 Their team created space in the lobby, constructed additional display furnishings, and assisted RACC staff with the reinstallation of Kaskey’s original form and mold for Portlandia’s face. A tall pedestal and prominent location was also made for the 1/10th scale model created to guide the fabrication of the full sized sculpture. What happens to the full-scale Portlandia during the renovation? The 35 foot tall symbol of our city will be completely covered for 15 months while work on the Portland Building façade takes place. During that time a “Portlandia fix” can be had at The Plaza Building where Kaskey’s delicately crafted scale model will serve as a stand-in. For a limited time, until the day Portlandia gets covered by her protective screening (sometime in late January) the public will have a unique opportunity to view both the large and small versions of the statue from the same spot on SW 5th Avenue. Our sincere thanks go out to The Standard for their ongoing support of the arts and for making this display possible while the Portland Building is renovated! www.standard.com.